You can create builds for Nexus devices using Android Open Source Project (AOSP) builds and the relevant hardware-specific binaries. For available Android builds and targeted devices, see Source Code Tags and Builds. You can also create builds for HiKey Android reference boards, which are designed to help non-Nexus component vendors develop and port drivers to Android releases. Using a reference board can ease upgrade efforts, reduce time-to-market for new Android devices, lower device costs by enabling ODM/OEMs to choose from a wider range of compatible components, and increase the speed of innovation among component suppliers. 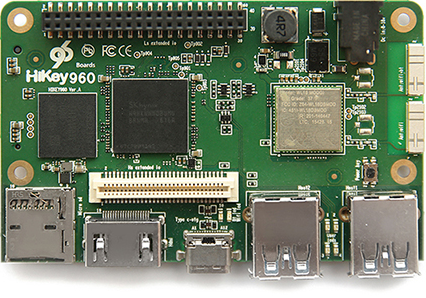 Google supports HiKey960 and HiKey certified 96Boards as Android reference boards. AOSP provides kernel source and board support for HiKey so developers can easily create and debug new and existing peripheral drivers, do kernel development, and perform other tasks with fewer OEM encumbrances. 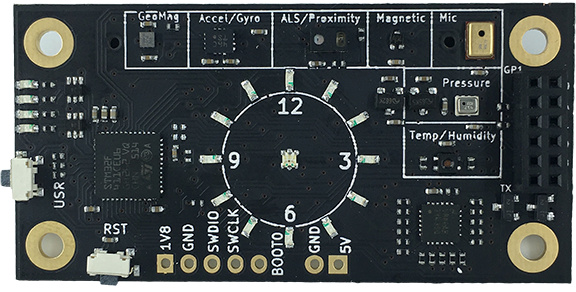 To develop new ContextHub features that use new sensors or LEDs, you can also use a Neonkey SensorHub connected to a HiKey or HiKey960 development board. 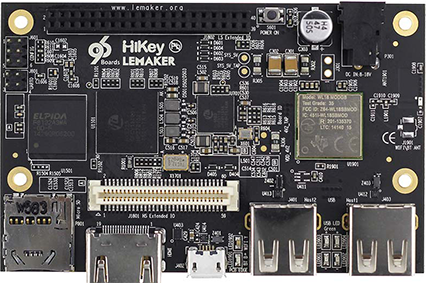 The HiKey960 board is available from Amazon.com and Lenovator. Use the following commands to download, build, and run Android on the HiKey960 board. Select fastboot mode turning ON switch 1 and 3 (for details, refer to the HiKey960 user guide). Turn OFF switch 3 and power cycle the board. Enter fastboot mode by turning ON switch 1 and 3. Update the kernel in the boot image. Bootloader exports the generated serial number to kernel via androidboot.serialno=. Edit the device/linaro/hikey/hikey960/BoardConfig.mk parameter BOARD_KERNEL_CMDLINE and configure the video setting. Example setting for a 24" monitor is video=HDMI-A-1:1280x800@60. Use the following commands to download, build, and run Android on the HiKey board. Note: For 4GB eMMC, instead of $ make -j32 use: $ make -j32 TARGET_USERDATAIMAGE_4GB=true. Select special bootloader mode by linking J15 1-2 and 3-4 pins. Connect USB to PC to get ttyUSB device (ex: /dev/ttyUSB1). Remove jumper 3-4 and power the board. Enter fastboot mode by linking J15 1-2 and 5-6 pins. Remove jumper 5-6 and power the board. Copy hi6220-hikey.dtb (arch/arm64/boot/dts/hisilicon/hi6220-hikey.dtb) to the hikey-kernel directory as file hi6220-hikey.dtb-4.9. Copy the Image file (arch/arm64/boot/Image.gz-dtb) to the hikey-kernel directory as file Image.gz-dtb-4.9. Edit device/linaro/hikey/hikey/BoardConfig.mk parameter BOARD_KERNEL_CMDLINE and configure the video setting. Example setting for a 24" monitor: video=HDMI-A-1:1280x800@60. Set the J2 low speed expansion connector to 1 - Gnd, 11 - Rx, 13 - Tx. To develop new ContextHub features that use new sensors or LEDs, you can use Neonkey SensorHub connected to a Hikey or Hikey960 development board. Kernel source and ContextHub board support is available in AOSP to help developers create and debug new sensors, make new HAL and kernel changes, etc. with fewer OEM encumbrances.